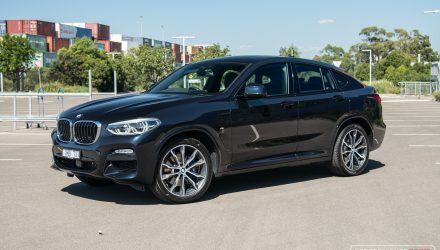 Looking to buy a 7-seat SUV? 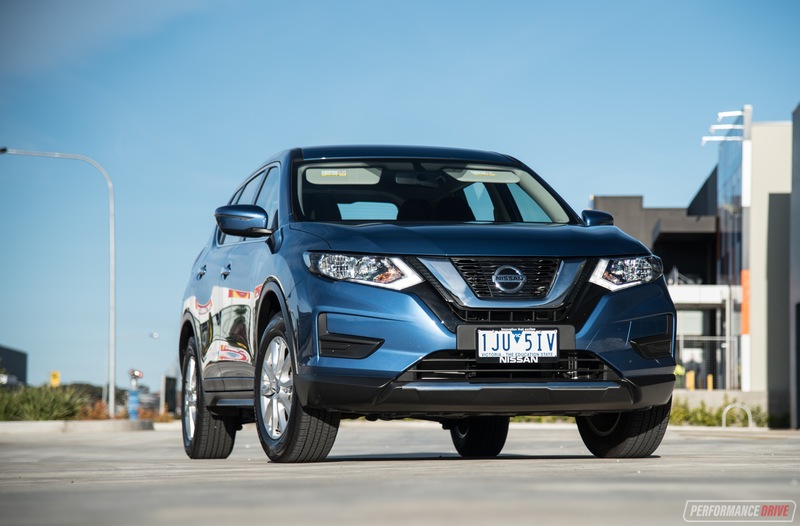 Did you know you don’t necessarily need to step up to the large SUV segment? 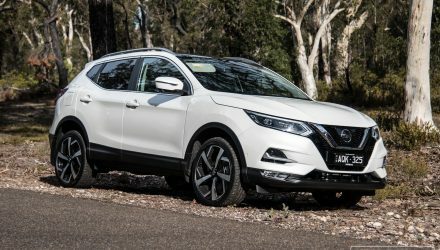 There are now a number of products in the more popular medium SUV class that offer seven seats, such as the 2017 Nissan X-Trail ST presented right here. 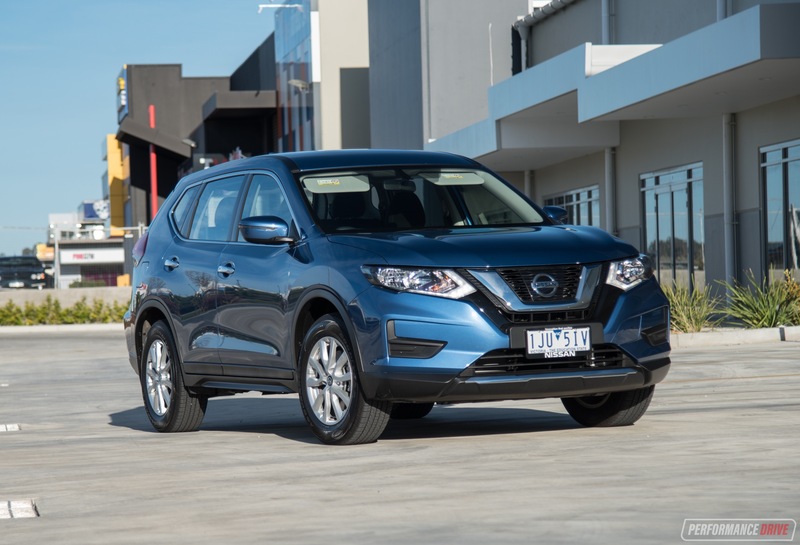 Nissan updated the X-Trail earlier this year with the introduction of a new 2.0-litre turbo-diesel option. 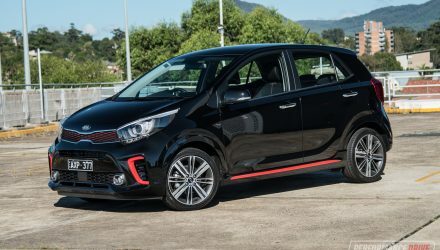 The diesel option is certainly an interesting package worth considering, with its 130kW/380Nm outputs providing respectable economy and performance. 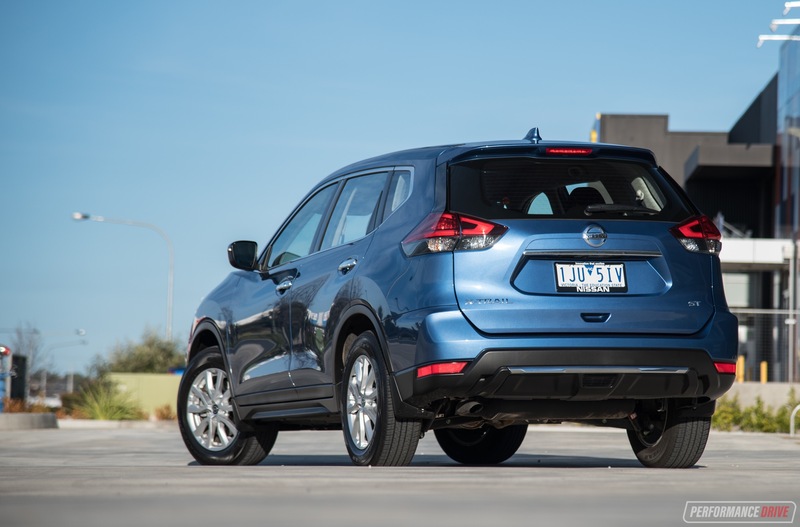 What we’re testing here though is the base model X-Trail ST 2WD seven-seater, priced from $31,990. 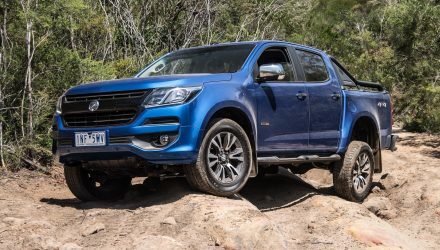 Buyers can jump into the new diesel from $35,490, and it comes with the added safety and versatility of four-wheel drive as standard. 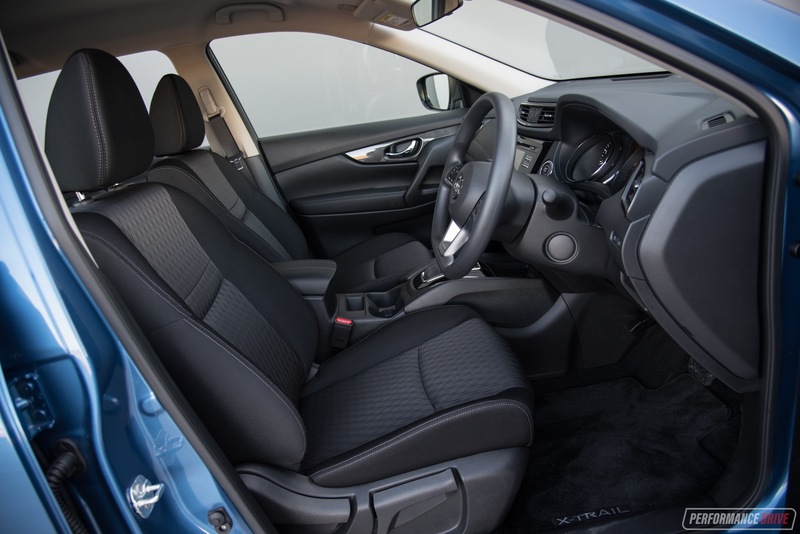 However, if you need the seven seats you only have the ST and ST-L petrol 2WD options. 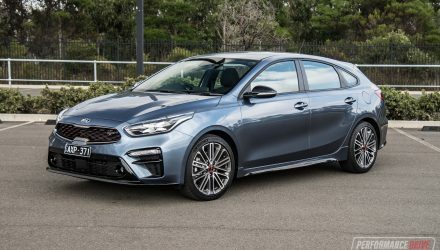 Nissan says it expects the ST variant to be the most popular, accounting for around 45 per cent of sales, with diesels accounting for around 8 per cent and seven-seat options making up about 15 per cent. Nissan’s practical-focused interior decor is pleasant to approach, with every area feeling like it’s immediately familiar. 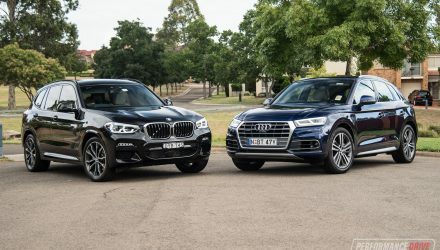 Everything is placed where you’d expect it to be placed, in stark contrast to its French, Korean-made brother, the Renault Koleos, sharing the same platform. One drawback is the touch-screen. The unit in the X-Trail is starting to get on a bit, with pretty basic graphics and antiquated menus and ‘apps’. 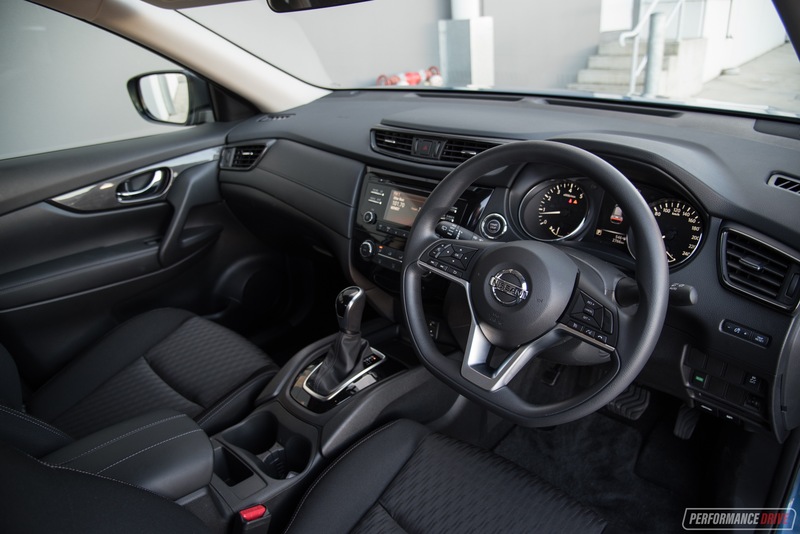 The screen itself is also quite small in comparison to most rivals, including the flawed Koleos mentioned above. 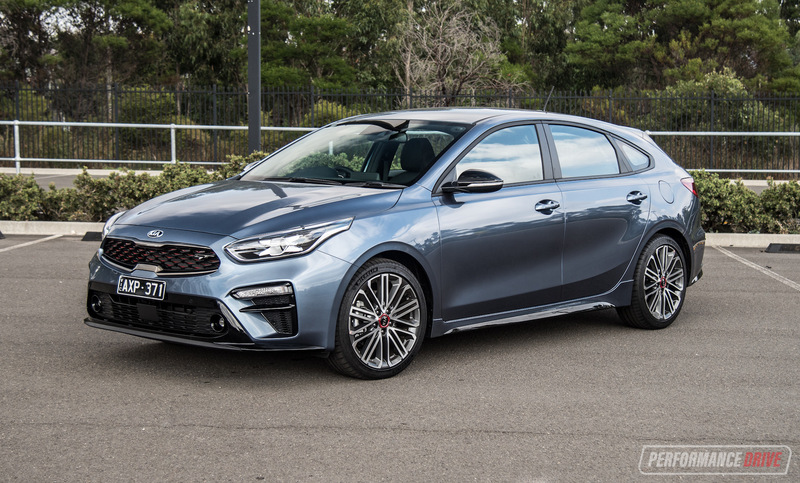 It does present plenty of features though, such as a display for the standard rear-view camera and full Bluetooth connectivity, which is not bad for a base model. You won’t find Android Auto or Apple CarPlay in here though, which shows some indication of its age. 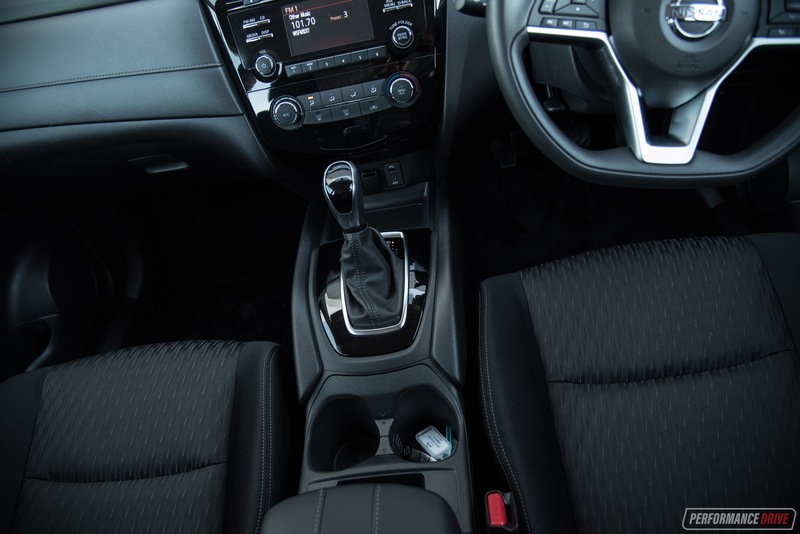 We like the cabin materials and general quality inside. 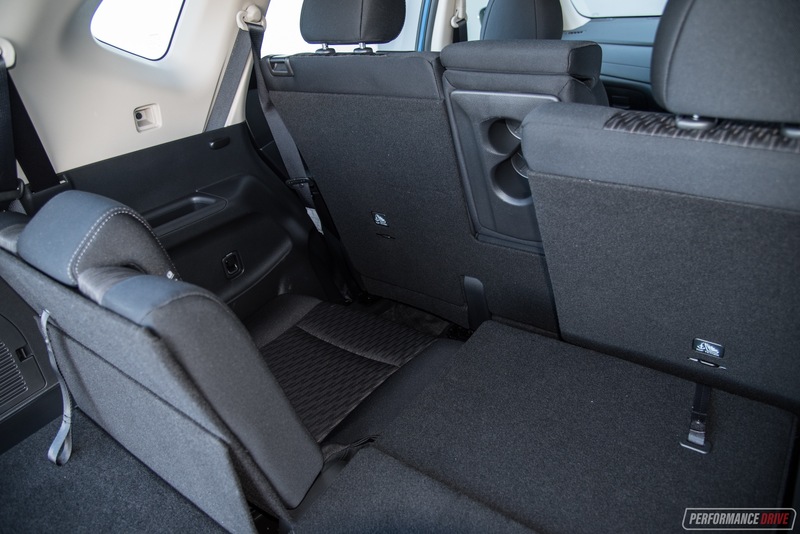 The seat fabrics feel robust and durable yet modern in design, and the plastic trimming around the lower dash and door cards isn’t as tacky or scratchy as one would expect. Again, for a base model. Even the floor carpets feel thick and high quality, with decent noise suppression from the outside world helped by rubber-like sections in some areas. Cabin space is good. 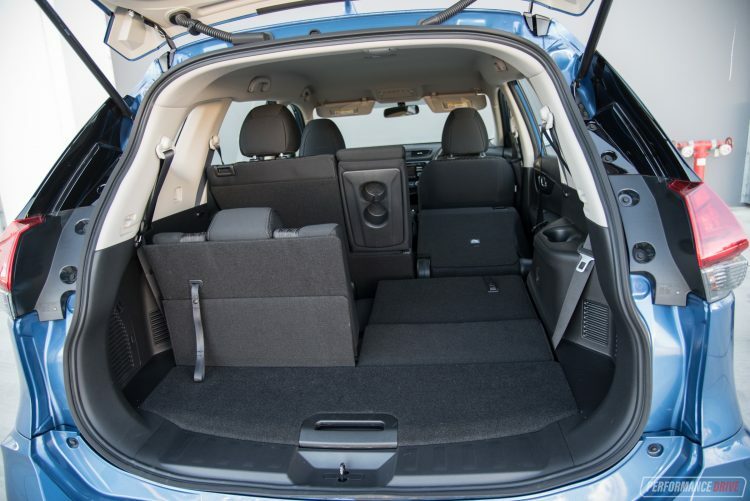 We’d put the X-Trail at the upper end of the class in terms of interior space and accommodation. 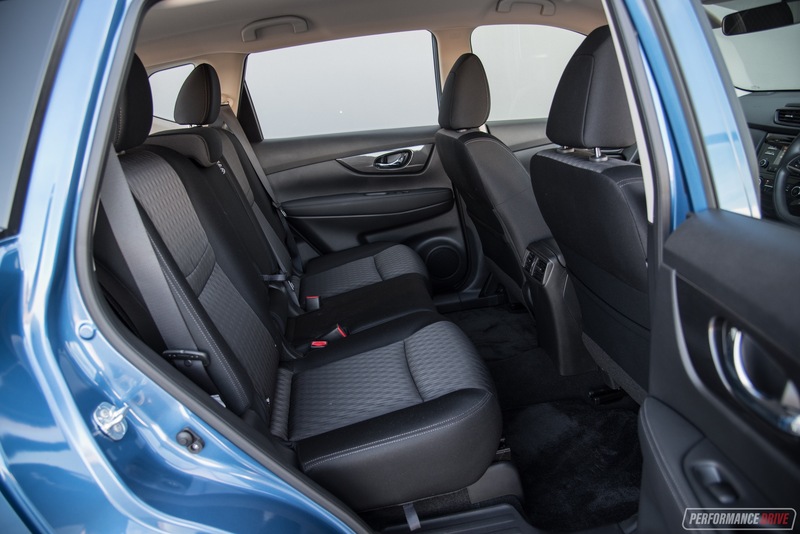 Rear seat legroom is particularly commendable, with respectable headroom and cushion comfort for long journeys. The quality of the materials, despite this not being a premium vehicle, are impressive. 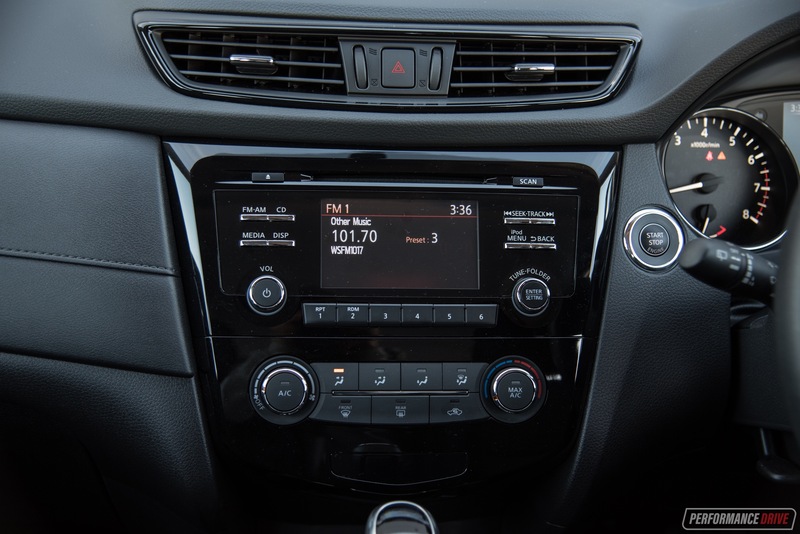 Nissan has fit climate vents in the back of the centre console too, unlike many vehicles in the mid-size SUV class. As for that third row? Well, it’s really only designed for kids. You can slide the entire middle bench forward to open up some legroom, but even so, the third-row back rest is very short and the seats are essentially mounted on the floor. But since there are not many SUVs in this class that offer seven seats at all, the X-Trail has to be awarded some points here for trying. It’s worth noting the class favourites – Mazda CX-5 and Hyundai Tucson – don’t offer seating for seven in any variant. Flipping up the third row requires a bit of effort. 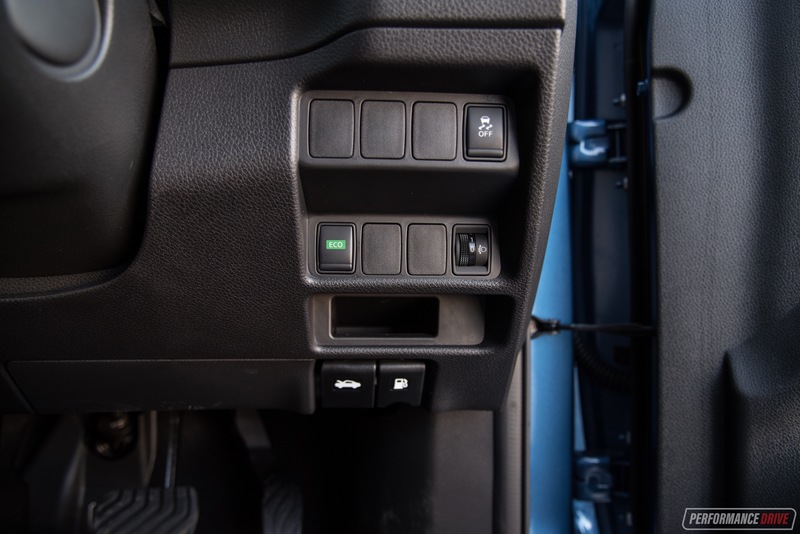 You need to yank the tabs from the cargo area, with some initial long-arm reach. However, that’s it. Once the backrest is pulled up and clicked into place, you’re done. There’s nothing to fiddle with in regards to the lower seat cushion. 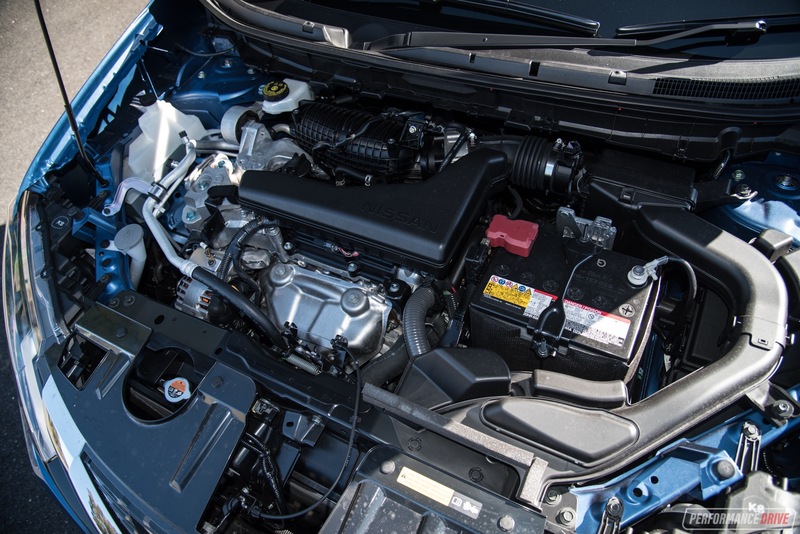 With them down the cargo volume is rated at 445 litres, down from 565L in the regular five-seat version. 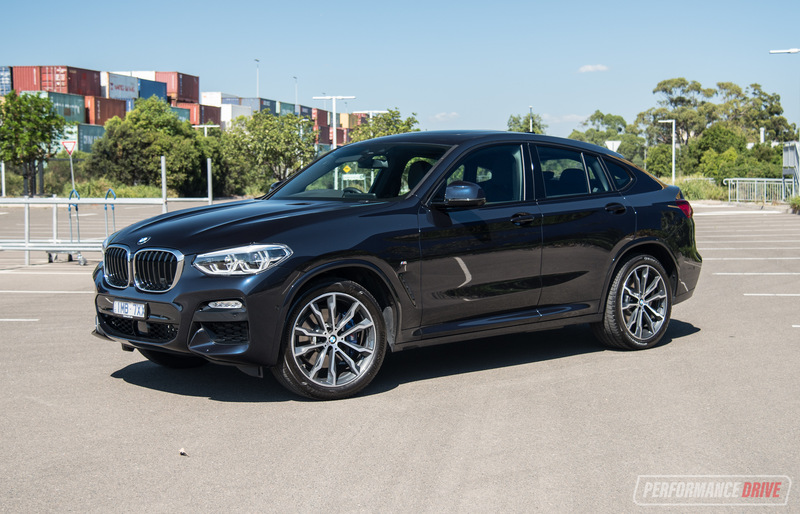 In seven-seat configuration you’re left with 135L. 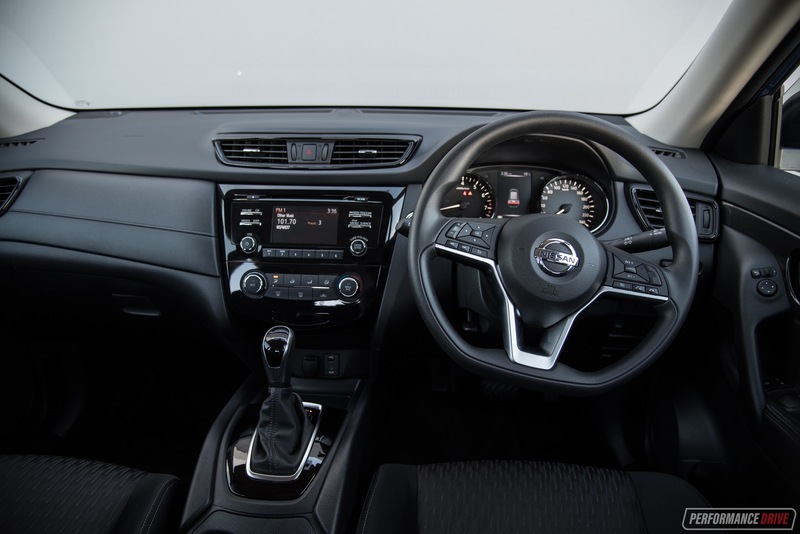 Much like the interior functionality, the X-Trail is one of those vehicles you instantly warm to. Sitting relatively perched up you do get a decent view outside, which is going to be quite important to buyers in this segment. 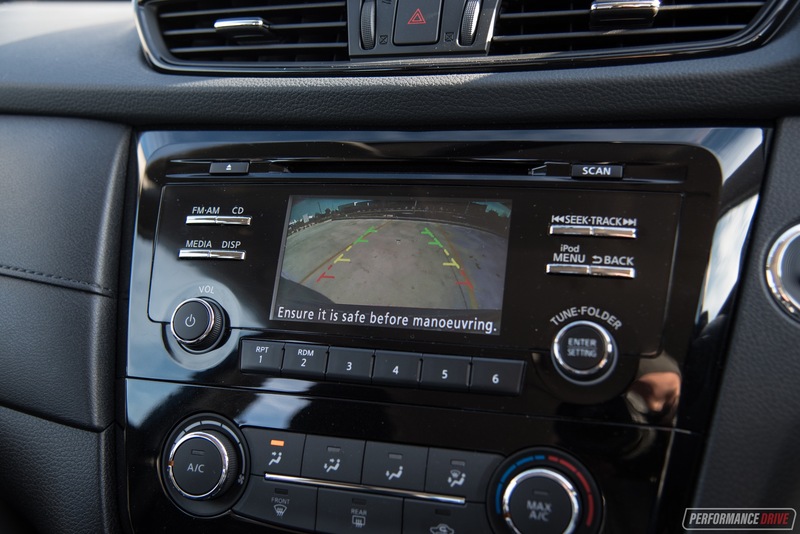 Thanks to some thin A-pillars and decent-size windows, forward and blind-spot visibility is also good for added confidence on the road. 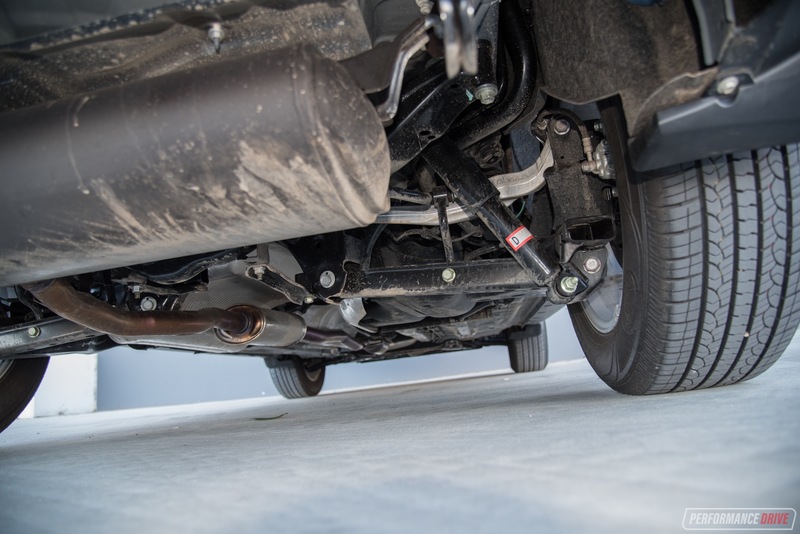 Steering around bends, the X-Trail’s platform is well-sorted. 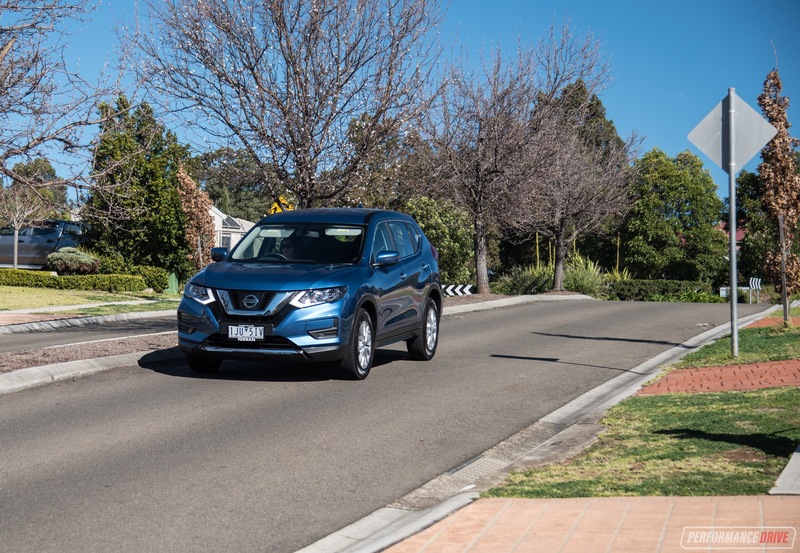 It’s not as engaging or as exciting (if those terms could even be used in this class) than the Mazda CX-5, but the friendly controls make for a comfortable and pleasant drive that’s never unsettling. 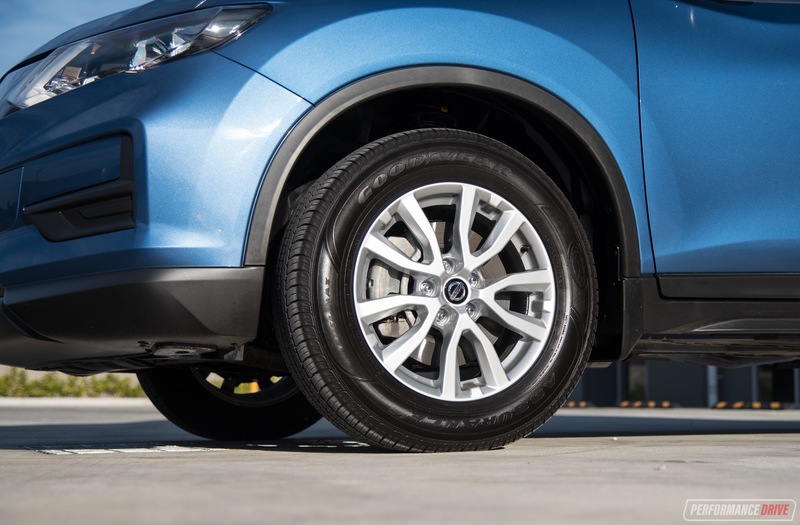 Upping the tempo does send the Goodyear 225/65 tyres into a bit of a squealing frenzy, but we’re surprised by the noticeable jump up in composure and grip these tyres provide over the Nexen tyres fitted on the Renault Koleos brother. 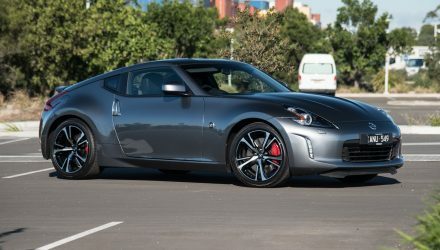 This also has a sizeable impact on braking performance. 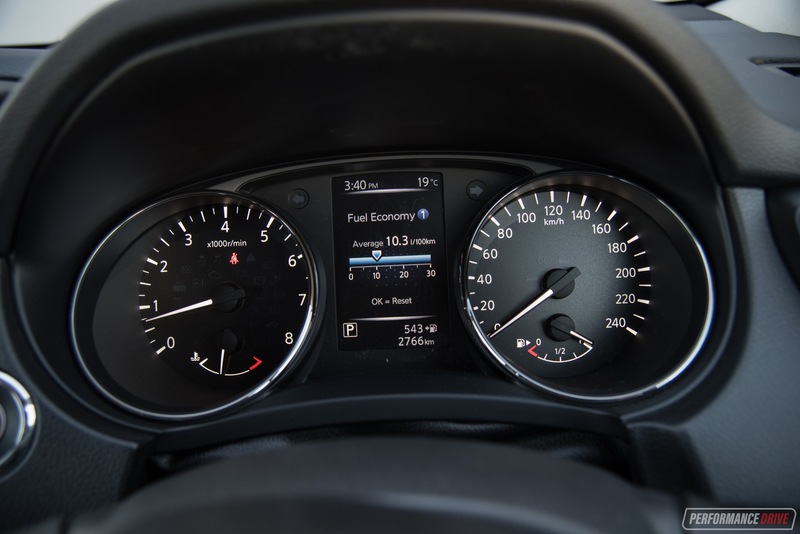 Across the emergency stop from 100-0km/h, the X-Trail pulled up in 40.48 metres, compared with 42.77m in the Koleos. This isn’t a comparison but it is interesting to see the difference. 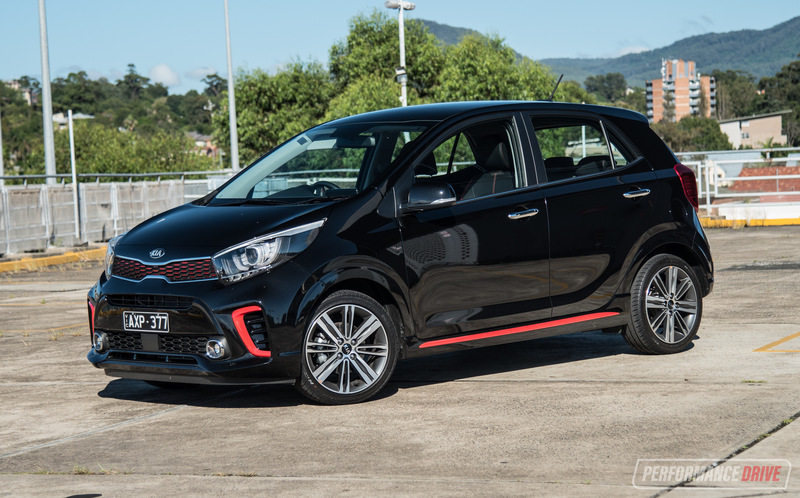 The standard 0-100km/h sprint comes up in a best of 9.66 seconds, which is about average for the petrol class. 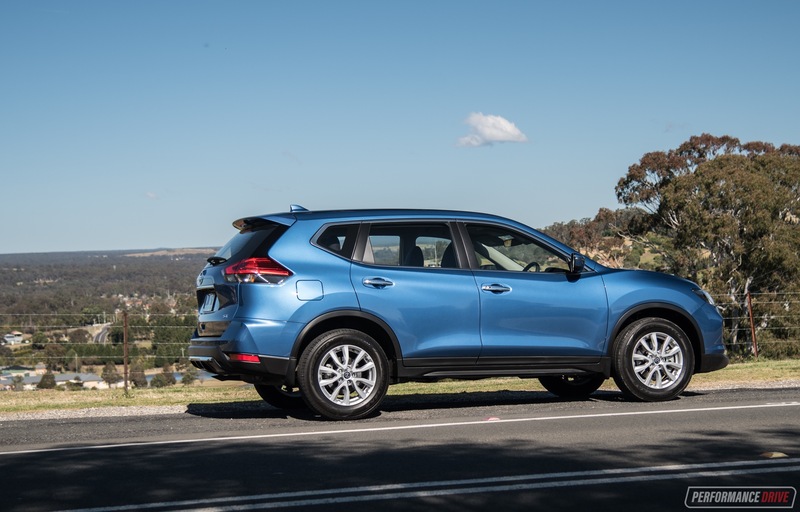 A range-wide 210mm of ground clearance does give the X-Trail a certain level of trail-exploring ability, even in front-wheel drive form. 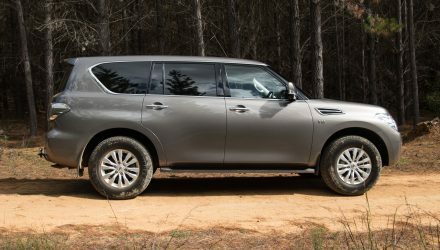 If you enjoy getting out into the wilderness and doing some camping, the X-Trail is more than ready for some rough dirt roads and mild ‘4×4’ tracks. 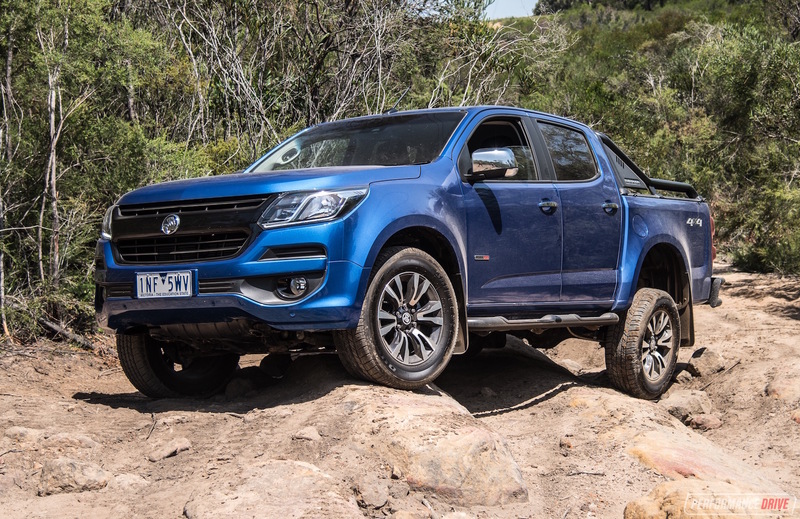 Those tall tyres help in this area too, absorbing some of the impact of rocks and corrugations, and wrapping around lose surfaces to some degree for decent traction. In this very popular segment – the most popular SUV class of all, in fact – there are many options to choose from. 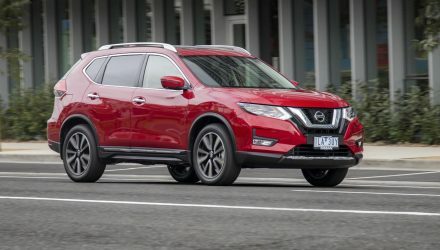 Should the X-Trail be on your shortlist? We think it should. 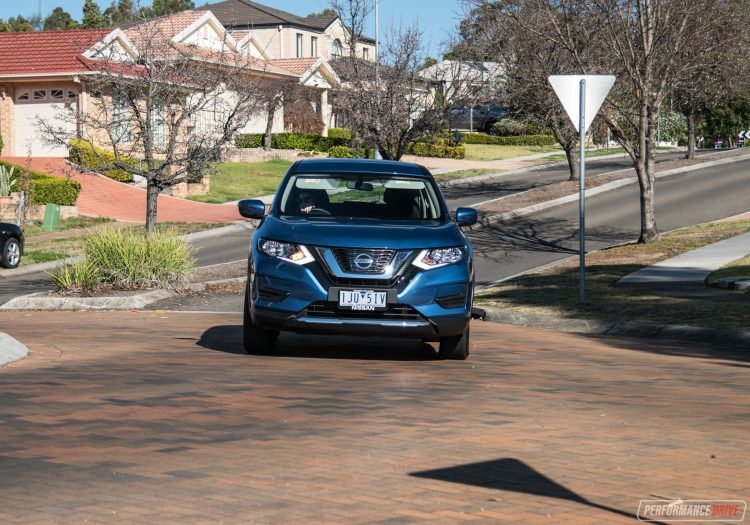 It’s not as driver-focused or as flashy-designed as the CX-5 and it’s not as efficient or as interesting or innovative as the new Honda CR-V, but what the X-Trail does best is cover all bases. It is one of the best all-rounders and it will suit a very wide audience type.